Not many books begin with the line 'Ï am ashamed to have written this book'but the candid and humorous 'How to Cook and Eat in Chinese' first published in 1945 (now out of print) was written not by the author and home cook Buwei Yang Chao, a doctor by profession, who studied medicine in Tokyo and learnt to cook because she found Japanese food 'úneatable'. It was penned by her linguist husband who clearly favored the tongue and cheek. He coined many of the Chinese culinary terms that we use so often today. Among them are Pot sticker and stir fry first used in this cookbook, also possibly the first ever major Chinese cookbook in English. 2 months ago I found a rare first edition of this wonderful cookbook, a collaboration between a first generation American Chinese couple and their second generation American daughter who made the United States their home at a time when Chinese culture was a complete mystery to most Americans. The cookbook of 200 odd recipes was described by Jane Holt as 'an authentic account of the Chinese culinary system' in the 1945 NY Times review but interestingly a comparison between Chao's Sour-Hot Soup and a Hot and Sour soup by Jamie Oliver or Martha Stewart reveals that some of Chao's recipes are much simpler than contemporary versions. Chef Bruce Cost's Hot and Sour soup described as the real thing by Epicurious lays great emphasis on the use of lily buds and various mushrooms while Chao's recipe doesn't even mention these. Likely she omitted these because they would have been difficult to find in the United States in the 40's. The book was written at a time when fresh ginger was so exotic Chao suggests using powdered ginger root instead. Most of her recipes are mellow by today's standards and do not contain hot peppers. Chao's recipe for Sweet-sour sauce fish another globally popular Chinese dish has fewer ingredients than say Martin Yan's version. Contemporary versions have some vegetables and fruits like bell peppers, pineapple and hot chilli. Chao's recipe calls for a whole fish, I used cubed Mahi Mahi. This sweet and sour sauce can be used with tofu, noodles, chicken and other kinds of meat as well. This is my version of a classic Chinese dish that became popular globally in the 40's and 50's. 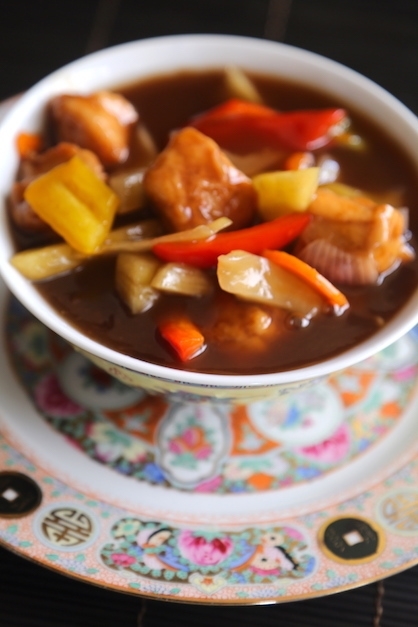 The sweet and sour sauce can be used with noodles, pork, tofu and vegetables. This dish can be made vegan by replacing the fish with firm tofu. Combine marinade ingredients in a bowl. Add fish and stir gently to coat. Cover and refrigerate for 20 minutes. Combine ingredients for the sweet and sour sauce in a small saucepan and stir well to ensure there are no lumps. Place beaten egg and cornstarch in separate dipping bowls. Dip fish in egg, then dust in cornstarch on all sides. Add oil into a small kadai, wok or deep saucepan to a depth of about 2 inches. Bring oil to 360 degrees F or to test oil drop a small piece of bread into it. If it sizzles and rises to the top the oil is ready. Add fish, a few pieces at a time, and cook until golden brown. Drain on paper towels. Heat a tablespoon of this oil in a saucepan or wok. Add scallion bulbs and ginger and saute until fragrant and soft. Add the carrots, capsicum, bell peppers, white, green onion stalks and sweet and sour sauce. Cook until sauce begins to bubble. Stir to prevent burning. Add pineapple and fish. Stir gently and cook on a low flame about 2 minutes. Taste for salt and spicy-ness. Adjust as per taste. Serve hot with boiled white rice or fried rice. 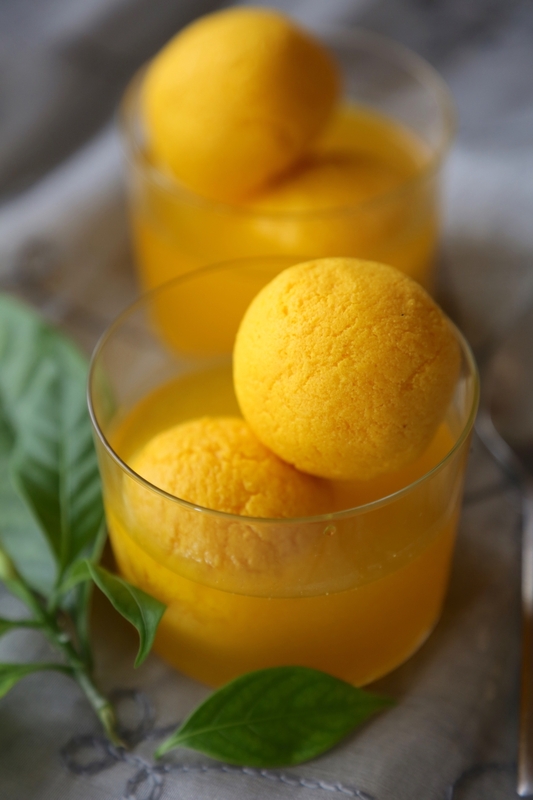 Raj Bhog is a traditional Bengali dessert prepared from split milk fat. It is made for special occasions like the Bengali New Year or Pohela Boishakh and Durga Puja. Dust a plate with 1 tbsp flour. Reserve.Using a mortar pestle finely powder the 6 saffron strands. Add 2 tablespoons water and dissolve. Knead together 1 kg chenna and the saffron water and divide into 10 equal portions. You can make them bigger or smaller. Generally Rajbhog is larger than Rasgulla. Reserve on a plate. Cover with a clean cloth. Divide the stuffing into 10 equal portions. Wet the palms of your hand with clean drinking water. Flatten each ball of chenna gently between the palms of your hands to make circles of about 2 inches. Place one portion of the stuffing in each circle and bring the ends together to seal the edges on top. Using your palms mold the stuffed Raj Bhogs into smooth balls. Fill a serving bowl with one cup of ice cold water. Reserve. Combine the sugar and 4 cups of water in a large pan and deep pan atleast 6 inches in depth. Swill the pan about to mix the sugar and water before you put it over the fire. Place pan on medium flame. After about 3-4 minutes, slowly using a pastry brush drizzle water from the sides of the pan so it drips into the sugar.Do not dip the brush in the sugar water. Water added at this stage will reduce the temperature of the sugar syrup and will not allow it to caramelize. Continue to cook the syrup over a medium flame for about 10 minutes. Keep dripping water into the sides of the pan to ensure it doesnt' brown. Increase the flame and boil vigorously for 1 to 2 minutes. Keep aside. It will be about 2-2-5 cups of liquid now. Sprinkle 1/2 teaspoon flour into the sugar syrup. The mixture will froth. Gently using a slotted spoon lower the rolled Chenna balls one by one into the hot liquid. Keep the flame on high. Do not varys temperature when boiling the Raj Bhogs. Continue dripping water into the mixture using a pastry brush to ensure the syrup doesn't brown. Ensure that the syrup froths all the time while cooking the Raj Bhogs. To check if the Raj Bhog is cooked drop one into a pan of cold water. If it sinks it is ready. If it floats return it to the hot syrup and continue cooking. Switch off flame. Working quickly with a slotted spoon remove the Raj Bhogs into the serving bowl that contain cold water. Slowly drip a cup of cold water into the remaining sugar syrup using a pastry brush. If you do it too quickly the sugar water will seize and crystallize. Using a sieve strain it over the Rajbhogs and discard any bits and pieces. Cover and chill for approx. 6 hours before serving. 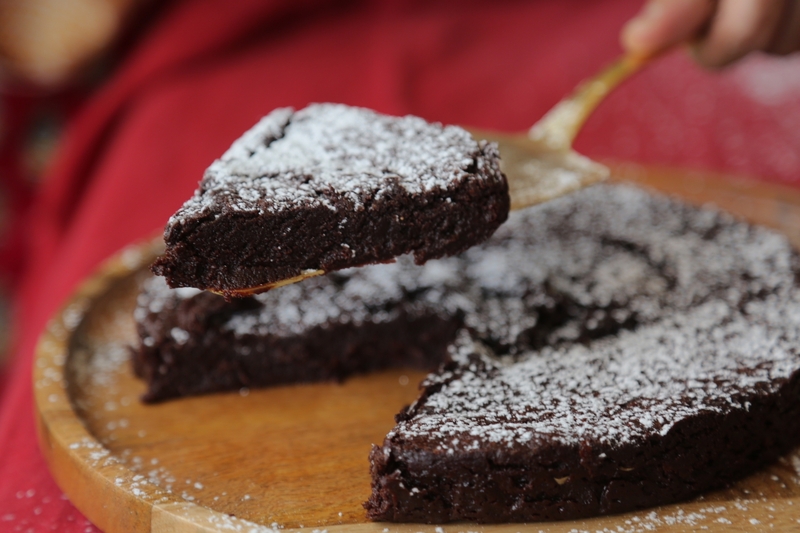 This is a simple but decadent flourless cake. Use regular good quality cocoa. Preheat the oven to 375°F. Lightly butter an 8" round cake pan; cut a 7 1/2-8 inch round piece of parchment or waxed paper to fit and lay it in the bottom of the pan over the buttered base. Melt the chocolate and butter in saucepan on low heat, stirring constantly. Heat only until chocolate softens. Then take off the fire and continue to stir by hand until all the chocolate has melted. Stir in the sugar and cocoa powder until you have a smooth batter without lumps. Add the eggs, and incorporate thoroughly. You will have a thick and shiny batter. Bake the cake for 25-35 minutes or until the top has a paper thin crust. It will continue to cook some once removed from the oven. Remove it from the oven, and cool it in the pan for 45 minutes. Refrigerate it for a couple of hours before unmolding it. This is a soft cake but solidifies when refrigerated making it easier to unmold. You can always warm it on your serving plate after you have unmolded it. Loosen the edges of the pan with a short thin blade and turn it out onto a large flat plate. Then flip it over again onto your serving plate.Warm it in the microwave if if you like or let it sit 20-25 minutes before serving. Edges maybe a bit uneven. Dust with powdered sugar and serve slices as is or with whipped cream. This cake is also delicious warm with ice-cream or sorbet. Fresh berries too. Combine the chopped red chillies and salt in a small bowl and mix. Reserve. The salt mellows the acid int he chillies making them less hot. Remove the stalk of the broccoli and slice into tiny pieces and reserve. Cut broccoli into florets. Reserve separately. Heat oil and butter in a medium size point on medium flame. Add onions and 3/4 of the chopped red chillies and sea salt. Saute until soft and translucent. Add garlic, chopped stalks of broccoli and carrots. Saute another 3-4 minutes. Add broccoli florets, black pepper and toss well. Pour water to just cover the tops of the broccoli. Stir in rice flour. Cook open until vegetables are soft. Stir in milk or cream and continue cooking 2-3 minutes. Cool then puree to a smooth or consistency. 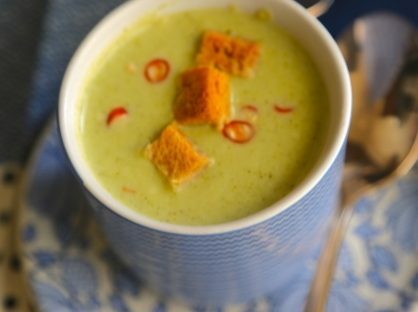 I like to leave bit of broccoli and carrot in the soup for texture but its up to you. Add salt and stir. Taste for salt and spiciness. Stir in some Habanero hot sauce and salt if required. 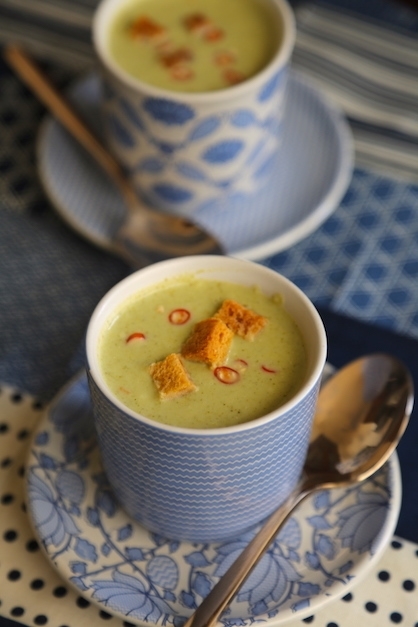 Pour hot soup into bowls, mugs or cups. Garnish with leftover salted red chillies and croutons.